ICE cotton futures traded within a fairly narrow range for the first two weeks of November, before advancing. 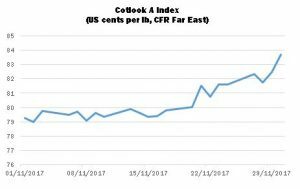 The Cotlook A Index moved up 145 points on November 21 to 81.50 US cents per lb, CFR Far East, and ended the month at 83.70 cents, the high point for November. It is not easy to discern a single, clear reason for the rally in futures; however, some commentators pointed to renewed speculative buying and late fixations against the December contract as contributory factors. 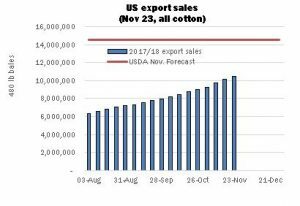 Other influences doubtless included the sustained strong pace of US export sales, questions regarding the proportion of high Micronaire cotton in West Texas, and the general rally in US equity and commodity markets. As prices rose, import buying slowed in many markets. Pakistan was an exception to that general trend, in that demand for US cotton proved strong during a period when uncertainty prevailed as regards constraints placed on imports from India. Late in the month, however, news emerged that the restrictions were to be relaxed, which resulted in some business being concluded on a tentative basis (subject to such the relaxation being confirmed). US export sales remained robust throughout the period. In the week November 9, a marketing-year high was posted of 506,700 running bales. By November 30, total US upland and Pima commitments had risen to over ten million running bales, equivalent to about 72 percent of USDA’s export projection for the season (14.5 million bales of 480 lbs). In its November report on supply and demand, USDA took account of reported gains in southwestern states and increased its estimate of US production by one percent, to 21.38 million bales of 480 lbs (4.654 million tonnes), which would be the highest level recorded since 2006/07. Some private observers continue to question the size of USDA’s Pima forecast (697,000 bales), based on evidence from yield data. During the month in review, Cotlook’s assessment of global production included a reduction for India to 38 million local-weight bales of 170 kilos (6.46 million tonnes), on reports of fairly widespread attacks of pink bollworm, coupled with damage due to late-season rainfall in central growing areas. The crop would still represent the largest quantity recorded since 2014/15. In Pakistan, a marked slow-down in arrivals over the month – notwithstanding growers’ efforts to secure as much seed cotton as possible in view of firm prices – appeared to indicate that a smaller than anticipated total crop is in prospect. Adverse weather, it would seem, served to hinder the late development of plants. Cotton Outlook’s production figure was lowered in November by 50,000 tonnes, to 1.85 million. Together with a few other minor adjustments, these changes brought a reduction in Cotton Outlook’s forecast of global production in 2017/18 of just over 50,000 tonnes, to 25,973,000 tonnes, which would represent a season-on-season increase of just under 14 percent. 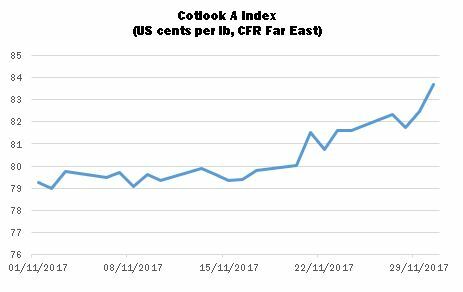 As regards world consumption of raw cotton, very little change to Cotlook’s estimate seemed warranted during November. Mill demand for raw cotton remained fairly steady and some stability was imparted to yarn values by the firmness of replacement costs for raw cotton. Economic reports from major markets appeared generally to be quite positive. Our forecast of consumption for the current season is 25,184,000 tonnes, which implies growth of nearly 1.6 percent in relation to the previous campaign. An addition to global stock levels of over 790,000 tonnes appears in prospect by the end of 2017/18, down modestly from the 840,000 envisaged a month ago. 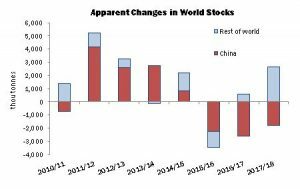 However, as consistently noted, expectations of a sizeable stock reduction in China (almost 1.9 million tonnes) disguises the situation in the ‘rest of the world’, where an addition in excess of 2.6 million tonnes is foreseen.